In 3-quart saucepan, place sweet potatoes, garlic, water and salt. Cover and heat to boiling; reduce heat to low. Simmer covered 15 to 20 minutes or until tender (do not drain). Heat oven to 350°F. In small bowl, mix 1 tablespoon melted butter, the coconut and gingerroot; spread on ungreased cookie sheet. Bake 6 to 8 minutes, stirring frequently, until golden brown. Mash potatoes, cooking liquid and 3 tablespoons butter with potato masher or electric mixer on low speed until no lumps remain. Spoon into ungreased casserole or serving dish. Sprinkle with coconut mixture. Instead of coconut, try chopped pecans as a topping for the potatoes. The moistness of sweet potatoes varies by color. 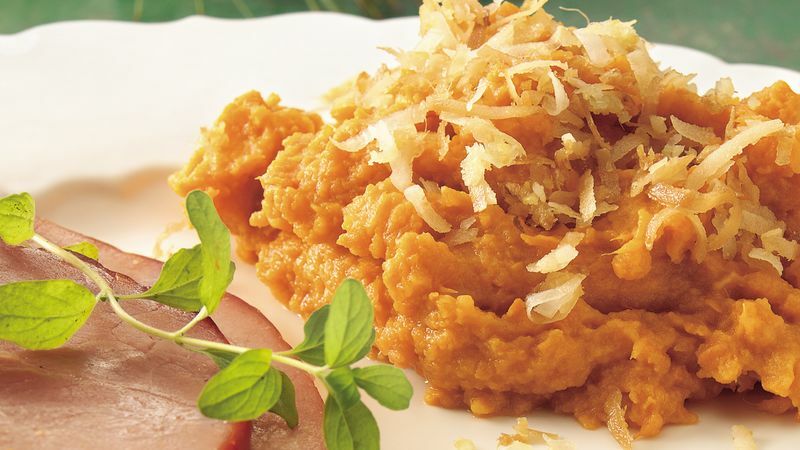 Lighter sweet potatoes have a drier texture, so you may need to add milk or water when mashing them. Put the mashed potatoes in a microwavable dish, cover and refrigerate. Make the topping and store at room temp. To serve, microwave the potatoes, loosely covered, on High for 10 to 12 minutes, stirring several times, then sprinkle with the topping.